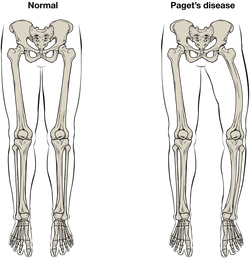 Paget disease tends to effect skull, tibia, femur, spine and pelvis. It may affect one or multiple bones. The common causes of Paget disease may include infection by paramyxovirus. The infection may lead to an increase in the osteoblastic and osteoclastic activities. There are few stages of Paget disease. The first stage is known as osteolytic. In this stage there will be large osteoclasts with resorption pits. The second stages is the osteoclastic- osteoblastic stages with mosaic patten of the lamellar bone which indicates destruction and formation of the bone at the same time. The final stage is known as late osteosclerotic which present with sclerotic bone with dark mosaic line ( thick trabeculae). There will be mixed lucency and thickening detected on the radiography. There will be an increase in the growth of the bone and pain in the bone. Patient may develop complications such as fracture of the bone, osteosarcoma, loss of hearing and high output heart failure. Serum ALP will be raised. The treatment of Paget disease may include bisphosphonates.